Realistically, Holistic Hemp Scotland is probably one of the few true remaining “artisanal” CBD oil companies in the UK — if not the world. While so many other brands have sold out and outsourced their supply and production methods in an effort to maintain competitiveness during the “CBD boom,” Holistic Hemp has remained true to their roots, both literally and figuratively. The UK firm continues to hand-pick all of their hemp crops from small EU-based organic farms, which they then proceed to hang, dry, and cure 100% naturally without the use of heavy, commercial machinery. 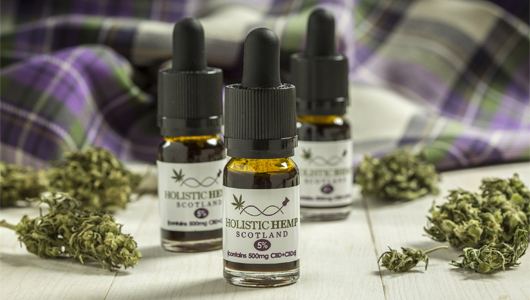 Find out more about this unique, botique-style UK CBD oil brand in this in-depth Holistic Hemp Scotland review, where we review products and prices, extraction methods, where to buy, and more. Who Is Holistic Hemp Scotland? As we’ve said, Holistic Hemp is a small artisanal UK CBD oil company based in Scotland. 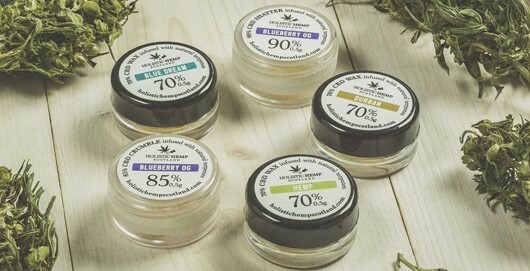 Unlike the majority of their current-day competitors who have taken to importing massive amounts of low-quality hemp fiber from India and China to lower overhead costs, Holistic Hemp has remained true to their company values by ensuring 100% of their CBD oils are sourced from pure, organic, freshly-grown EU hemp. Not only that, the company actually hand picks their entire crops when they are ready for harvest, and then lays them out by hand in an open-air environment for several weeks’ drying and curing time. By contrast, most other commercial CBD oils for sale in the UK are mass-sourced and mass-produced, cultivated my monstrous automated machinery and ground into fine bits for transport, and then flash-cured in what essentially is an industrial-sized oven to minimize the overall processing time. While effective for obvious (financial) reasons, this overly-commercialized process results in the dramatic deterioration of the natural hemp plants, and ultimately, both the quantity and quality of the resulting CBD oil. By seeing out the entire CBD oil production process by hand – from seed to sale – Holistic Hemp Scotland not only optimizes the purity and potency of their end product, but also ensures that the natural CBD content within the hemp flowers is maintained from start to finish. In other words, you are getting the purest, most therapeutically active product possible when you buy Holistic Hemp CBD oil in the UK. In fact, our Holistic Hemp review made it pretty clear that this is one of the highest-quality CBD oils (if not the highest quality) hemp oil product being sold in the United Kingdom today. We cannot recommend them enough. Honestly, it was difficult choosing only five key points in terms of highlighting the best aspects of Holistic Hemp CBD oil. The company operates on such a high level and with such precision and quality that their entire manufacturing process – from the planting of the hemp to its cultivation and eventual extraction – is virtually flawless. Moreover, it’s worth pointing out that Holistic Hemp CBD is extracted in small, low-pressure CO2 extraction machines as opposed to the massive industrial CO2 machinery that is used in most other UK CBD for sale. This may not seem like a big deal, but the key difference between the size of the machinery is that with smaller-scale equipment, the manufacturing process can be carried out at a much slower pace – meaning low temperatures and very low pressures can be used to extract the active CBD compound form the hemp fibers. With larger industrial-sized equipment, the entire process is sped up and optimized for cost-efficiency, meaning that (in most instances) the CBD is extracted under a high-temperature, high-pressure environment. In other words, this means that much of the CBD is compromised and/or eliminated by the time it reaches the actual end product (i.e. the CBD oil). Small artisanal company. Again, this is not a large-scale company like most other CBD oils for sale in the UK today. Holistic Hemp is the same small firm today as it was when it first started, and that is saying a lot in terms of the distinction in purity and quality that it offers compared to other UK CBD oils. Cannabis Trades Association UK. Trust us – not every UK CBD oil for sale is backed by the Cannabis Trades Association (CTA). Basically this organization is responsible for overseeing both the quality of the hemp plants that are being used for CBD oil production, and also the production/extraction methods themselves in order to ensure that only the safest, highest-quality products are being made available to customers. Holistic Hemp is one of just a handful of UK CBD oil companies that is 100% backed by the CTA. Hand-picked, naturally cured hemp. Compared to commercial, industrialized hemp cultivation and extraction methods which largely diminish the quality and potency of the therapeutic CBD compound, our Holistic Hemp review showed that this is a company who takes great pride in its hand-based cultivation methods. Not only do users end up with a cleaner, safer, and more potent product, but they’re also much more likely to experience positive therapeutic benefits when using Holistic Hemp CBD oil compared to other mass-produced labels. Global shipping. Holistic Hemp Scotland is of course based in the UK, but the good news for international customers is that they do offer global shipping (you can check on official website for all of the countries that they do ship to). Free shipping to the UK. Another great thing we discovered during our Holistic Hemp review is that the company offers free shipping to addresses throughout the UK, as long as orders are over £100. For all other orders, a small flat-rate £5 shipping fee is applied. If you haven’t caught on yet as to how thoroughly pleased we were with our Holistic Hemp review, then perhaps you should re-read the earlier part of this article! In all honesty, this is easily one of the most professional, knowledgeable, high-quality CBD brands in the UK today. That said, if we had to pull teeth and choose a couple things that we weren’t 100% pleased about, we would say that it’s mildly unfortunate Holistic Hemp CBD oils aren’t available in a wider range of potencies, as currently the only tincture on offer is a 5%, 10mL CBD oil. Also, given the relatively small economy of scale in which Holistic Hemp CBD oil is made, it seems the products are prone to selling out and going on backorder – particularly during periods of high consumer spending in the UK. Fortunately, the company sources from multiple organic hemp farms throughout the UK, so it typically is only a short period of time before they receive a new crop of hemp in, and can restock their shelves for their loyal, ever-growing customer base. And lastly, it’s a bit of a shame that Holistic Hemp Scotland doesn’t offer CBD edibles as part of their product range, as we’re sure they would produce some of the tastiest, most delicious items on the market if they did. During our multi-stage Holistic Hemp Scotland review, I actually got a chance to try their 5% CBD tincture, as well as their CBD wax, which I used in my brand spanking new Showerhead Faberge Egg dab rig (which, by the way, I absolutely LOVE). I will say that for a 5% oil, Holistic Hemp CBD tinctures offered an amazingly high level of potency and effectiveness for my daily anxiety, as well as my come-and-go headaches, which I usually get about 3-4 of per week. The relaxing effects are obvious and relatively fast-acting (although not the fastest-acting I’ve ever had), but my favorite thing of all was that they seemed to last all day long – I literally did not take more than one dose over the course of a 24-hour period for a week straight. In terms of my Holistic Hemp review for the wax concentrate, which I used in a dab rig, I’ll say that the product was (for me at least) more reminiscent of an actual marijuana dab than a non-psychoactive dose of CBD. Not that I got high at all – I didn’t – I just mean that the smell, taste, and physical act of dabbing always seem to remind me of getting really, really high. In terms of actual effectiveness, the Holistic Hemp CBD wax did seem to relieve my headaches almost instantaneously, though I only used it on two separate occasions (if you’ve read any of my previous UK CBD oil reviews, you’ll know that I’m not a huge fan of dabs or vaping). Regardless, I give Holistic Hemp CBD oil products a no-brainer 10/10 rating; undoubtedly some of the purest, most well-made tinctures currently on the market. As we mentioned earlier, one of our only “downfalls” we discovered during our Holistic Hemp review was the fact that the firm doesn’t offer tinctures in a variety of strengths/potencies. They currently only offer a 5% tincture (which works incredibly well), but it would be nice if they had some higher-strength options for customers looking for a more serious form of use. Hemp CBD Oil Tinctures | Holistic Hemp CBD oil for sale comes in two different options: a 5% “Alpine” tincture that is made from organically-grown Swiss Alps hemp, and a CBD + CBDa formula that contains added cannabinoids for an increased synergistic effect.Both options come in 10mL bottles and contain 500mg of CBD, meaning you get a fairly potent 2.5mg serving of CBD with each single drop. (The company recommends administering 10-20 drops under the tongue, 1-3 times per day).Costs are £29 for the 500mg “Alpine” CBD oil, and £35 for the one with added CBDa. 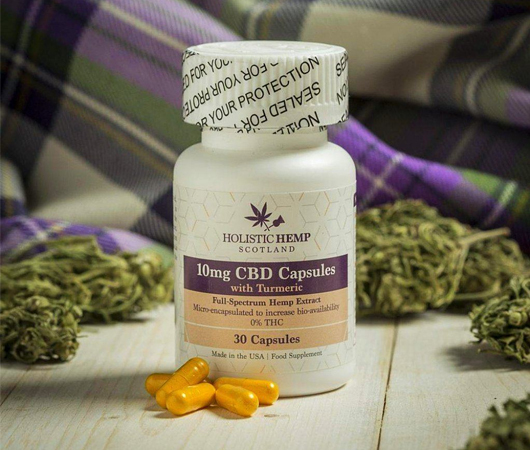 CBD Capsules | For those who don’t want to deal with the potentially cumbersome act of measuring out and administering droplets under the tongue, CBD capsules that you swallow whole can be a great alternative to getting your daily cannabidiol dose.Holistic Hemp CBD capsules for sale come in bottles of 30, and are available with or without the addition of naturally-extracted Turmeric.The standard capsules cost £40 and contain 15mg of CBD each, while the added Turmeric capsules contain 10mg of CBD each and cost £45. Holistic Hemp recommends that you take 1 capsule at a time 1-3 times daily, with food and water. 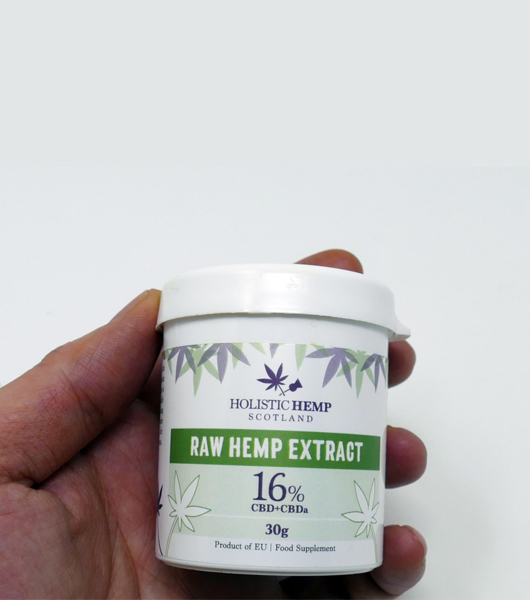 High-Potency Hemp CBD Paste | Holistic Hemp hemp paste is essentially a much more potent version of their oral CBD tincture. These come in plastic syringes, and are available in two options: 1g (20% CBD) and 3g (15% CBD).The 20% (1g) hemp paste syringe contains a total of 200mg of CBD, while the 15% (3g) paste contains a whopping 450mg of CBD total. Prices range from £12.50 to £25, and Holistic Hemp recommends you take between 100-200mg 1-3 times per day (not exceeding 3 servings in a 24-hour period).These products are much more potent than the standard 5% Holistic Hemp CBD oil for sale, and are generally used by people with more severe conditions. CBD Concentrates (Wax, Shatter, Dabs) | Holistic Hemp is one of the few companies that offers high-quality CBD dabs for sale in the UK. These are highly-purified CBD concentrate products containing up to 90% CBD, and can be used in either a vaporizer or a dab rig.They come in three different varieties (70% CBD wax, 85% CBD crumble, 90% CBD shatter), and range in price from £35 to £70. Other Holistic Hemp Scotland CBD Products For Sale | In addition to their CBD oils, capsules, pastes, and CBD concentrates, Holistic Hemp also sells a variety of other hemp-based products, making sure to utilize 100% of the plant rather than just the therapeutic leaves and flowers.For example they offer a line of “Luxury” Hemp/CBD-infused teas, as well as hemp fiber construction materials (most commonly used for natural home insulation) and hemp textiles that can be woven into fabric to make rope, clothing, etc.Another really awesome thing that we found out during our Holistic Hemp Scotland review was that the company offers wholesale CBD for sale in the UK, meaning as long as you qualify as a commercial customer (you’ll have to contact them first to find out if you do), you may be able to receive large wholesale pricing discounts on their range of CBD products. 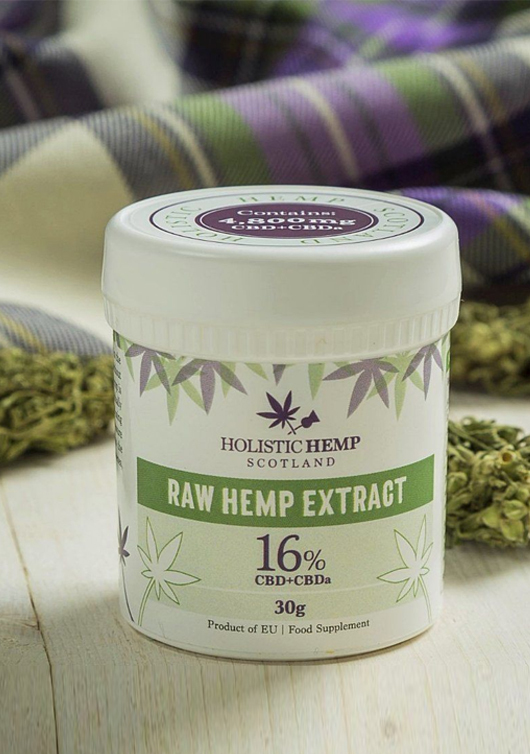 Given their artisanal business model and their hand cultivation/CBD oil production methods, we were blown away when we found out during our Holistic Hemp Scotland review that the company was able to offer such affordable – even competitive – prices. In fact, they are certainly no more expensive than some of the better-known UK CBD oils for sale out there, and are indeed much more higher quality (in our opinion) than 95% of products that are much, much more expensive than they are. All in all, I think it was pretty clear that our Holistic Hemp CBD oil review showed this is one of the highest quality UK firms in the business right now. They have stayed true to their 100% organic, EU-sourced hemp supply while the majority of the competition has outsourced to India and China, and they are able to hand-cultivate and use low-temperature CO2 extraction techniques while still offering some of the most competitive, affordable prices on the market. Simply put, we cannot recommend this lovely Scottish-based company enough. 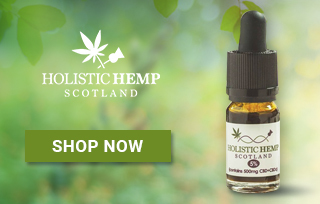 If you are seriously considering trying out cannabidiol or adding it to your daily health routine, we highly, highly suggest you check out Holistic Hemp Scotland CBD oils – genuinely some of the best quality tinctures on the market, hands down. Undoubtedly, Holistic Hemp CBD Oil has helped me a lot in relaxing and falling asleep after a long day at the office. Pleased to have an oil that I know has been produced from organic farms in the Alps. I like that the website tells you exactly what country the honey comes from in their 4500mg Raw CBDA Honey – makes me feel at ease while I’m using it. After using several brands of CBD, I can safely say that i have had the most positive therapeutic effects from holistic hemp CBD products. So pleased to have found them! A capsule a day keeps the doctor away – at least for me! These Full-Spectrum CBD Capsules have been keeping me upbeat and positive for weeks. Jade from Ashburn just bough! Bruce from Ashburn just bough! Virginia from Ashburn just bough!